The 1642 ‘Lords Justices’ issues were followed in 1643 by a larger (fourth) emergency issue of better made, but still crude, silver coins. 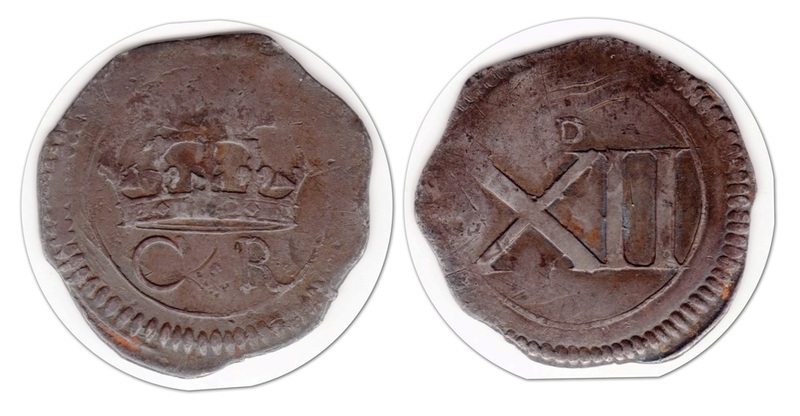 These are collectively known as ‘Ormonde Money’ since they were issued by the Lord Justice, the Earl of Ormonde (James Butler) some time between 1643-1644. Ormonde’s active career began in Ireland had begun in 1633 when he was appointed as ‘Head of Government in Ireland’ under the auspices of Thomas Wentworth, 1st Earl of Strafford, by whom Ormonde was treated with great favour. Wentworth planned large scale confiscations of Catholic-owned land, both to raise money for the crown and to break the political power of the Irish Catholic gentry – a policy which the converted Protestant Ormonde supported. 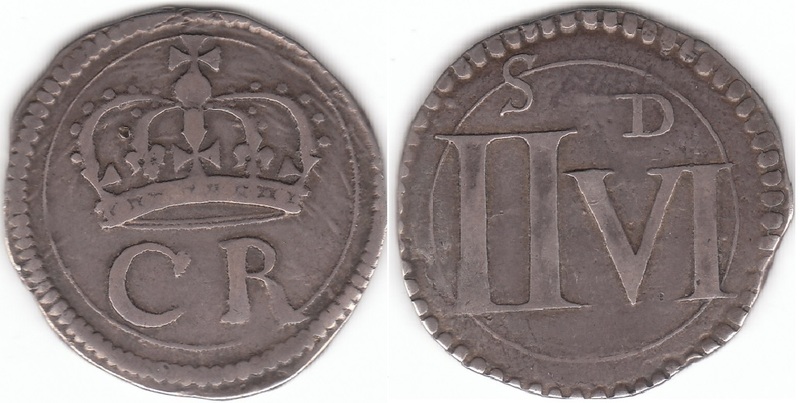 These coins were almost exclusively made from silver plate, cut and struck into a number of denominations with simple patterns including their value in ‘old style’ Roman numerals, where ‘4’ is written as ‘IIII’ and not the modern style ‘IV’ as seen on many modern coins. Sometimes, on particularly well-preserved examples, one can see the original patterns on the silver plate, and, very occasionally, a contemporary hallmark from the Dublin Silversmith’s Guild. 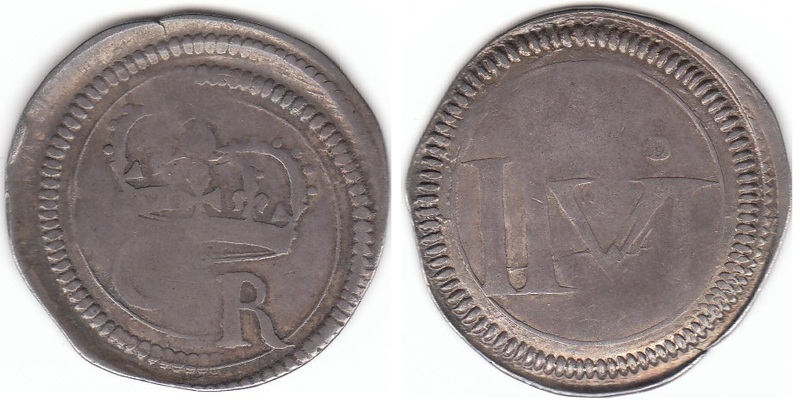 The heavier crowns and halfcrowns turn up more frequently at auction and tend to be better preserved than the smaller denomination (and lighter) pence coins – presumably the lighter coins were circulated more, show more ‘wear and tear’ and, therefore, were more likely to be melted down at a later date. The crowns and halfcrowns also show more die varieties due to more specimens being available for study. James FitzThomas Butler, 1st Duke of Ormonde, 12th Earl of Ormond, 5th Earl of Ossory, 1st Marquess of Ormond, 1st Earl of Brecknock KG, PC was an Anglo-Irish statesman and soldier, known as Viscount Thurles from 1619, Earl of Ormond from 1634 to 1642, the Marquess of Ormonde from 1642 to 1661 and the Duke of Ormonde from 1661 onwards. He was appointed commander of the Cavalier forces in Ireland and, from 1641 to 1647, he led the fighting against the Irish Catholic Confederation. Without actually changing sides, he found himself on the joint-Royalist-Confederate side in the fight against the Cromwellian conquest of Ireland. After a series of catastrophic defeats in this role, he lived in exile in Europe with King Charles II of England. 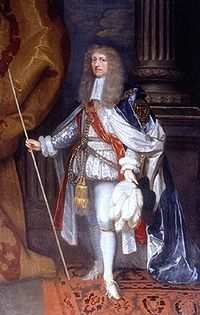 Upon the restoration of Charles to the throne in 1660, Ormonde became a major figure in English and Irish politics, holding many high government offices, including his elevation to an English dukedom in 1682. James Butler was the eldest son of Thomas Butler, Viscount Thurles and of Elizabeth, Lady Thurles, daughter of Sir John Poyntz of Iron Acton in Gloucestershire. His paternal grandfather was Walter Butler, 11th Earl of Ormond. Upon the shipwreck and death of his father in 1619, this 8 year old boy was (by courtesy) styled Viscount Thurles. It was not long before James I of England, anxious that the heir of the Butlers should be brought up a Protestant, placed him at Lambeth, under the care of George Abbot, archbishop of Canterbury. At eighteen he went to Portsmouth with his friend George Villiers, Duke of Buckingham intending to join the expedition for the relief of Rochelle; a project abandoned upon the assassination of the Duke. Charles I gave his consent by letters patent, on 8 September 1629. In 1634, on the death of his grandfather, he succeeded to the earldom. On the outbreak of the Irish Rebellion of 1641, Ormonde found himself in command of government forces based in Dublin. Most of the country was taken by the Catholic rebels, who included many of Ormonde’s Butler relatives and their followers. Strangely, Ormonde’s bonds of kinship were not entirely severed. They began to raise their own regular troops, more organized and capable than the irregular militia of the 1641 rebellion. Also in early 1642 the king sent in troop reinforcements from England and Scotland. In March 1643, Ormonde ventured his troops to New Ross, deep in the territory of the Catholic Confederation, and won a small but indecisive victory there (Battle of New Ross) before returning to Dublin. Nevertheless, Ormonde was in a very difficult situation. The Confederates held two thirds of the island. Worse still, the king desired to recall troops from Ireland to fight his cause in England. In addition the Scots Covenanters, who had landed an army in the northeast of Ireland at Carrickfergus to counter the Catholic rebellion in that part of the country in early 1642, had subsequently put northeast Ireland on the side of the English Parliamentarians against the king; and the relatively strong Protestant presence in and around Derry and Cork City was inclined to side with the Parliamentarians as well, and soon did so. Isolated in Dublin, with the king seeking ways to minimize his Irish troops, Ormonde therefore agreed to a “cessation” or ceasefire with the Catholics, which began in September 1643, by which the greater part of Ireland was given up into the hands of the Catholic Confederation (leaving only districts in the north, the Dublin Pale, an area around Cork City, and certain smallish garrisons in the possession of Protestant commanders). For the previous two years the occupant of this post had not set foot in Ireland. This would allow their troops to be redirected against the Parliamentarians. Ormonde was faced with a difficult task in reconciling all the different factions in Ireland. The Old (native) Irish and Catholic Irish of English descent (“Old English”) were represented in Confederate Ireland—essentially an independent Catholic government based in Kilkenny—who wanted to come to terms with King Charles I of England in return for religious toleration and self-government. But, any concession that Ormonde made to the Confederates weakened his support among English and Scottish Protestants in Ireland. In 1644, he assisted Randall Macdonnell, 1st Marquess of Antrim in mounting an Irish Confederate expedition into Scotland. The force, led by Alasdair MacCollawas sent to help the Scottish Royalists and sparked off a civil war in Scotland (1644–45). 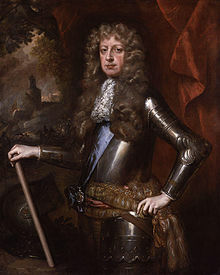 On 25 August 1645, Edward Somerset, 2nd Marquess of Worcester, acting on behalf of King Charles, signed a treaty in Kilkenny with the Irish Catholic Confederates without first airing the terms of the treaty with the Irish Protestant community. Irish Protestant opposition turned out to be so intense, that Charles was forced to repudiate the treaty almost immediately out of fear of ceding almost all Irish Protestant support to the other side in the English civil war. On 28 March 1646, Ormonde, on behalf of the king, concluded another treaty with the Confederates which granted religious concessions and removed various grievances. However, the Confederates’ General Assembly in Kilkenny rejected the deal, partly due to the influence of the pope’s ambassador (nuncio) Giovanni Battista Rinuccini, who worked to dissuade the Catholics entering into a compromise. The Confederates called off their truce with Ormonde, and arrested those among their number who had signed the treaty with Ormonde. Ormonde then judged that he could not hold Dublin against the Confederates. In order to save Protestant Dublin – the bastion of English rule in Ireland – he therefore applied to the English Long Parliament for help and signed a treaty with them on 19 June 1647 giving Dublin into the hands of the Parliamentarians on terms which protected the interests of both royalist Protestants and Roman Catholics who had not actually entered into rebellion. Ormonde attended King Charles during August and October 1647 at Hampton Court Palace, but in March 1648, in order to avoid arrest by the Parliament, he joined the Queen and the Prince of Wales at Paris. In September of the same year, the pope’s nuncio having been expelled, and affairs otherwise looking favourable, he returned to Ireland to endeavour to unite all parties for the king. However, the New Model Army took them one after the other, beginning with the Siege of Drogheda in September 1649. This left him with only the Irish Catholic forces, who distrusted him greatly. Ormonde was ousted from his command in late 1650 and he returned to France in December 1650. A synod held in at the Augustinian abbey in Jamestown, County Leitrim, repudiated the Duke and excommunicated his followers. In Cromwell’s Act of Settlement 1652, all of Ormonde’s lands in Ireland were confiscated and he was excepted from the pardon given to those Royalists who had surrendered by that date. Ormonde, though desperately short of money, was in constant attendance on Charles II and the Queen Mother in Paris, and accompanied the former to Aix and Cologne when expelled from France by the terms of Mazarin’s treaty with Cromwell in 1655. In April 1656 Ormonde was one of two signatories who agreed the Treaty of Brussels, securing an alliance for the Royalists with the Spanish court. In 1658, he went disguised, and at great risk, on a secret mission into England to gain trustworthy intelligence as to the chances of an uprising. He attended the king at Fuenterrabia in 1659, and had an interview with Mazarin and was actively engaged in the secret transactions immediately preceding the Restoration. On the return of Charles II to England as king, Ormonde was appointed a commissioner for the Treasury and the navy, made Lord Steward of the Royal Household, a Privy Councillor, Lord Lieutenant of Somerset (an office which he resigned in 1672), High Steward of Westminster, Kingston and Bristol, Chancellor of Trinity College, Dublin, Baron Butler of Llanthony and Earl of Brecknock in the peerage of England; and on 30 March 1661 he was created Duke of Ormonde in the Irish peerage and made Lord High Steward of England, for Charles’s coronation that year. At the same time he recovered his enormous estates in Ireland, and large grants in recompense of the fortune he had spent in the royal service were made to him by the king, while in the following year the Irish Parliament presented him with £30,000. His losses, however, according to Carte, exceeded his gains by nearly £1 million. On 4 November 1661, he was once more appointed Lord Lieutenant of Ireland, and busily engaged in the work of settling that country. The main problem was the land question, and the Act of Explanation was passed through the Irish parliament by Ormonde, on 23 December 1665. He had great influence over the appointment of judges: while he naturally wished to appoint to the Bench men of legal ability, a record of loyalty to the Crown was also generally required. Ormonde had ever loved, he loved to the end. Himself a merciful man, he encouraged the Irish judges to show a similar spirit of mercy; as he remarked, a man who has been reprieved can later be hanged, but a man who has been hanged can never be reprieved. In general the judges followed his example and, by the standards of the age, were merciful enough. Buckingham especially did his utmost to undermine his influence. Ormonde’s almost irresponsible government of Ireland during troubled times was open to criticism. He had billeted soldiers on civilians, and had executed martial law. He was threatened by Buckingham with impeachment. In March 1669, Ormonde was removed from the government of Ireland and from the committee for Irish affairs. In 1670, an extraordinary attempt was made to assassinate the duke by a ruffian and adventurer named Thomas Blood, already notorious for an unsuccessful plot to surprise Dublin Castle in 1663, and later for stealing the royal crown from the Tower. The outrage, it was suspected, had been instigated by Buckingham, who was openly accused of the crime by Lord Ossory, Ormonde’s son, in the king’s presence, and threatened by him with instant death if any violence should happen to his father. On his arrival in Ireland he occupied himself in placing the revenue and the army upon a proper footing. The ‘mildness and moderation of his measures’ served as the ground of an attack upon him in England led by Shaftesbury, from which he was defended with great spirit by his own son Lord Ossory. While wary of defending Oliver Plunkett publicly, in private he denounced the obvious falsity of the charges against him – of the informers who claimed Plunkett had hired them to kill the King he wrote that “no schoolboy would have trusted them to rob an orchard”. On 29 November 1682, an English dukedom was conferred upon him, and in June 1684 he returned to Ireland; but he was recalled in October in consequence of fresh intrigues. Before he could give up his government to Rochester, Charles II died; and Ormonde’s last act as Lord Lieutenant was to proclaim James II in Dublin. Unusually, James refused to take away his offices, and continued to hold him in respect and favour to the last. Despite his long service to Ireland he admitted that he had no wish to spend his last years there.